Since her mother's death, twelve-year-old Talia has felt as if she's alone on an icy sea. And then her marine biologist father decides to take her along to Churchill, the town on the edge of Hudson's Bay famous for its summer polar bears, for his summer work observing Beluga whales The cold, windswept village, seeming to hold its breath, waiting for the ice to break up, echoes her own feelings. Dad heads out on the ice to wait for the whales and Talia is left behind with Sura, a quiet but kind Inuit woman who knew both of her parents before Tal was born. "I'm glad you're here, Talia," Sura said. "I'm sure it's going to be awkward at first, being here." Awkward was putting it mildly. How normal was it to spend a summer in the Arctic with someone you've never met? I should have been glad to be here. To be away from everything that reminded me of Mom. But the small selfish part of me kept twisting my sadness into anger. I didn't want to share Dad with Churchill or the little white whales. I didn't want Sura to be glad about us being here. I wanted her to be upset with my dad for dragging me out here and then leaving me, like I was. All she has are memories are of her mother--their favorite unicorn story and her regret that she did not get to tell her mother goodbye. Talia fills her wish jar with her secret wishes as she waits alone for her father to return. But when her dad radios her that he has sighted narwhals near the mouth of Baffin Bay, Talia is seized with a hope that perhaps the narwhals have the power of unicorns to grant wishes. Tal always loved her mother's folk and fairy tales, but since her mother died, there is only one wish that seems meaningful but impossible at the same time--a second chance to tell her mother goodbye. Despite herself, when the birds return with warmer weather and the ice begins to retreat from the shore, Talia makes two friends, an ornithologist whom she calls The Birdman and his son, a boy named Simon, full of laughs and music, with a way of looking at her that makes her feel warm inside. But then her dad and his team's radio transmissions suddenly stop. Tal fears that he may have been killed by the shifting ice, and she realizes that she has a different wish to make if the narwhals come. 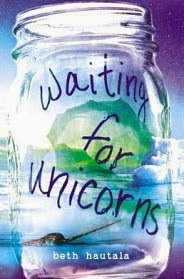 Debut author Beth Hauptala's Waiting for Unicorns (Philomel Books, 2015) tells the story of a girl whose heart is as icebound with grief as the frozen bay beside her, but one who learns that while some wishes can't be granted, others that she didn't know she had can become real. Hautala's narration is lovely, perceptive and personal, catching her character at the moment of the end of childhood and at the moment when grief breaks apart to admit new possibilities. As School Library Journal says, "This poignant story demonstrates that opening up to new experiences, places, and people can enrich life even in the aftermath of tragedy."